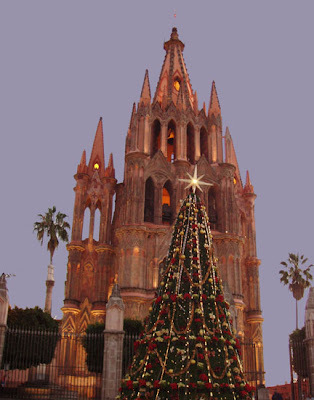 Well it's new year's eve and the town is abuzz with people- lots of Mexican tourists and visiting gringos.Tonight there will be fireworks and music and of course lots of noise. We are learning to listen selectively, which is really an art in itself. The morning begins with the announcement of the trash truck by a man banging on a piece of scrap metal with an old spoon, which triggers the barking of the roof dog that lives 2 doors down. Then the scratchy music from the propane gas truck and the clinking of tanks as they are unloaded. Church bells clang, calling people to daily mass. And amidst it all is the cooing of doves. I can't say that it does not get annoying sometimes, but mostly I find that I am glad to know that life is happening all around me, that I am not alone. That we are all a part of this chaotic cacophony of sound. May this be a year of inner peace, of profound discovery and and of the sound of hearts opening everywhere. Here's wishing you all a very special Christmas and New Year, however you choose to celebrate it. Here in San Miguel, Santa and Jesus are getting equal time. We have followed posadas behind Joseph and Mary seeking lodging down narrow streets with inflatable snowmen looking down at us from the rooftops. Christmas trees and mangers adorn the town and music is everywhere. No shopping frenzies here, and we haven't missed it one bit. 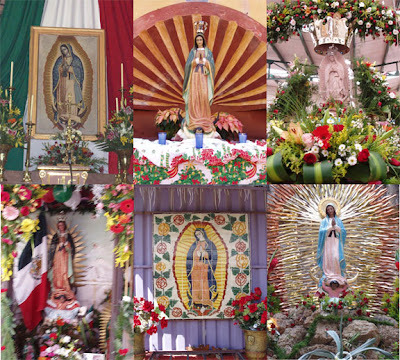 On December 12 Mexico celebrates the Vigin of Guadalupe, the spiritual mother of Mexico. Everywhere there are shrines to celebrate her- in the markets, on street corners, churches, shops. Here are a few of them. Era rodar y rodar, rodar y rodar. In the Jardin, the central plaza in San Miguel, the still point in the midst of this bustling town, a blind man wanders slowly and aimlessly amidst Mexicans and gringos alike, tapping his cane on the stone pavement, against the iron legs of the park benches, scattering the pigeons as he moves along,. He is clutching a small box of Carlos Quinto chocolate bars. “Cuanto?” I ask, as he stands before me. “Cinco pesos”, he says, and I place a coin in his hand and take a bar of chocolate from the box. He does not move on but stands there, as if waiting for his next cue. “Donde estoy?” he asks. “Where am I?” “You are in front of the Parroquia” I say, pointing ignorantly towards the towering dusty pink ornate church across from the plaza that serves as the town anchor . “Ah, si. 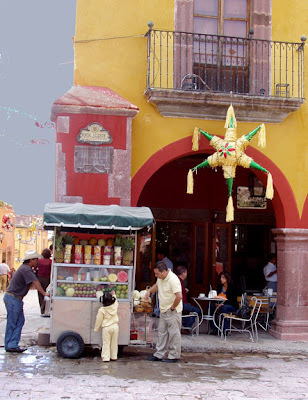 La Parroquia.” He says, and shuffles his feet, turning tentatively in the opposite direction. No, I say, and touch his sleeve to steer him. Finally a young Mexican man comes up and takes his arm, and together they walk towards the church, slowly and patiently. I unwrap the chocolate and take a bite. It is bittersweet, and tastes of dust and longing. Coming to Mexico has always felt like kicking off a pair of shoes you didn’t know were tight and putting on a pair of worn and comfortable old tennies. Stepping out of an exhausting world of ambition and consumption to just stop and sit on a park bench, pondering whether or not you should wander over to that little cart for a coconut ice cream cone. It takes a while to slow down. 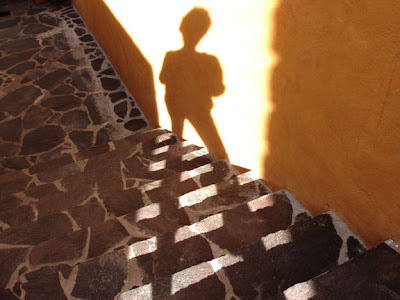 The first day I arrived in San Miguel I did what most gringos do. I walked down the cobblestone streets past old Spanish colonial buildings painted pink and ochre and rust, dodging busses and taxis and cars and street dogs and children, to come and sit here in the Jardin. To watch life happen around me. To turn my face up to the glorious Mexican sun and smile. 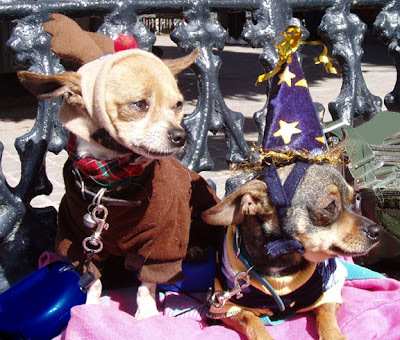 Sometimes a parade or procession will pass by with blaring musicians, or a little cart will roll by selling popsicles or steamed corn or balloons. An old man will wander by, singing Mexican corridos. Fireworks will explode in the sky for no apparent reason at all. The iron benches are scattered with people. Mexicans, tourists, expats. Here are the retired couples from Texas fondling real estate brochures, the single middle aged women with poodles in their arms. Ex corporate types who have shunned their salaries for a simpler life. Artists and writers and wanabees. Some have names you would recognize. For various reasons we have all come here to San Miguel. The beauty of being an expatriate, of living in another country like Mexico, is that after awhile you are no longer a part of the American culture, nor are you a part of the Mexican culture. And so you have a sort of a freedom to be yourself. Already Mexico is teaching me the things I need to learn. Charity. Patience. Tolerance. My heart begins to open it’s rusty hinges. Donde estoy? it asks. The church bells begin to clang and clang. Aqui! Ahora! they shout. Rather one must know how to arrive. So here we are escaping the cold and wet northwest winds and living the good life in San Miguel de Allende. We are renting a little house near the bustling town and spending our days sitting in the glorious sun listening to church bells, barking dogs, crowing roosters, fireworks, traffic. Eating spicy food, exploring the narrow cobblestone streets and high desert countryside. All of our senses assalted and awakened. What's next? Who knows, who cares? I am just beginning to feel the tingling of new creations and will be writing and painting them soon. So please keep checking in.